to restock his wholesale outlet. Enock benötigte 1325 US-Dollar, um ein Gewerbe im Bereich Großhandel auf- oder auszubauen. Enock benötigt für dieses Geschäft noch 925 US-Dollar. Enock, aged 40, lives in Ntungamo. He is married with four children and three attend school. He owns a wholesale outlet that sells maize flour and other groceries. This has been his main source of income for over 10 years. He started with a retail shop but kept on re-investing into the business, which necessitated further growth. 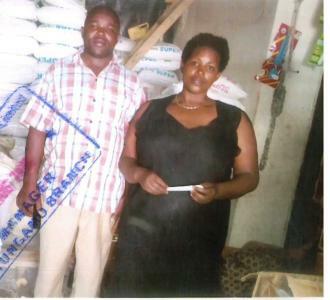 He has applied for a loan of 5,000,000 UGX to restock his shop so that he can serve the growing clientele. Enock is certain that his sales and income will increase, which will better the livelihood of his family. Enock sends his gratitude to the lenders for the support. Lastly, Enock is resilient and hardworking, and these have been pillars in his achievements. Pictured is Enock with his wife.